In 1999 I wrote a little song called “What A Girl Wants.” It became the first #1 song of the new century. That was also right around the time Napster was born. BMI’s Barbara Cane called me one day to discuss Napster. BMI was trying to fight them. Why? It went in one ear and out the other because I had a #1 song and I wasn’t paying attention to anything else. Right around the same time I got a call from a journalist who asked me how much revenue I thought I’d lost because of illegal file sharing. He mentioned this Napster too. Hmmm. I didn’t want him to know I had no clue wtf Napster was. But with everyone talking about it I figured I should find out: Napster was an online file sharing service where you can listen to music without paying for it. What? Imagine waking up one day and realizing the good or service that allows for your livelihood is now…free. I did the math. I coulda bought a house with the royalties that got hijacked. Everyone thought somebody would do something about Napster. Or that it would go away. But it didn’t. And to make matters worse other services popped up as well. Soon labels were shrinking, jobs disappearing and records stores were closing. Since then, it’s been a long, hard ride for songwriters. If music delivered to us by an invisible digital stream was here to stay (and don’t get me wrong, I enjoy streaming—it’s versatile, convenient and an all-you-can-eat buffet), then laws had to change to bring digital royalty distribution into a digital age. But how? There were a lot of powerful forces, stakeholders, money-grabbers and lobbyists working against that. Music organizations popped up monthly to lead the fight for transparency and an equitable distribution of income but none could get a handle the moving parts. One day, Michelle Lewis and Kay Hanley called Pam Sheyne and I and said…”You gotta meet this chick Dina LaPolt.” Dina LaWHo? “She’s this badass attorney and she’s gonna help us change things.” Seriously? It wasn’t just for our personal bank accounts that we decided to put our gloves on—we wanted to be part of a movement that would save our profession! Ok! Let’s do it. We called ourselves a Fempire. But then we found Adam Dorn and Adam Gorgoni, Jack Kugell, Brendan Okrent and Michelle Featherstone. We chose a name: SONA. We convened. We had a lot of coffee and bagels. More coffee and bagels. We scratched our heads. We got duped. We got smarter for having been duped. Each of us had a different expertise and perspective to bring to the table. We got along! We grew. We went to DC and charmed (and serenaded) senators. We made friends at the NMPA, the NSAI, ASCAP and BMI, NARAS and figured out how we could all work together for this very important common cause. We started being taken seriously…so much so that we had a voice in drafting new music legislation: The Music Modernization Act, which would ensure that everyone—songwriters, artists, producers and engineers—would get a digital raise. It sounds simple. It wasn’t. It took a few years. The legislation passed unanimously in the House and then in the Senate Judiciary Committee. We still needed the floor. And then, a few weeks ago, when everything was looking like we finally made it through the rain, we got wind that a certain entity (rhymes with delirious) was planning on thwarting our efforts. 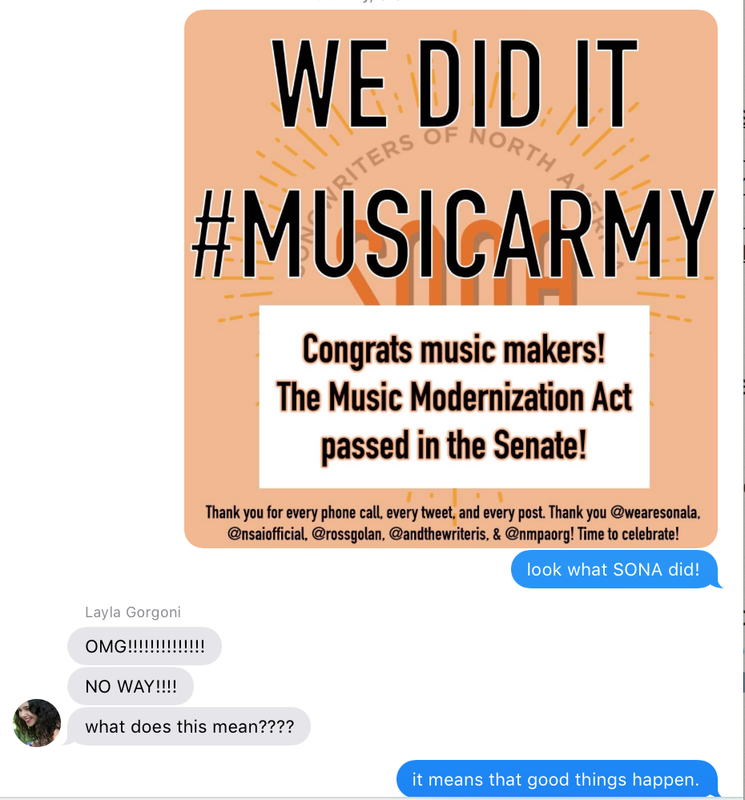 SONA (now 400 strong) formed a #MusicArmy, alongside Ross Golan (host of the podcast And The Writer Is…) in an aggressive outreach to gather hundreds of names of legendary music creators, (from Carole King to Max Martin; from Sam Hollander to Carly Simon—I got Carly…I was very excited about that! ) who would step up and lend their signatures to a letter of solidarity if this entity wouldn’t stand down. With SONA and Ross on the frontline was Desmond Child, Gregg Wells, Busbee, Billy Steinberg, Ryan Tedder, Matt Squire, Rachel Kurstin and Rick Nowels. Signatures poured in faster than we could document them. David Israelite from the NMPA was in the war room in DC, as was Bart Herbison from the NSAI in Nashville. Dina continued her efforts with Irving Azoff whose discussions continued with the player who didn’t want to play. Compromises were made. Agreements were back peddled on. As late as Monday morning, it is said that all had fallen apart. Apparently “Delirious” had hired a lobbyist to convince a senator (or 2) to kill the bill. Who were they? Was it Colonel Mustard in the Kitchen with a wrench? We manned our cells, and called offices. We tweet stormed the suspects. For a minute there we heard it was Elizabeth Warren but this came through to our own Kay Hanley on Monday afternoon. We sent our letter to Delirious and promised to make life miserable by boycotting their service if they succeeded in thwarting our bill. House of cards Brill Building! Yesterday, the vote went to the Senate floor. It passed. I was alone in a recording studio after a co-writing session watching it go down on C-Span. There was no one to jump up and down with or scream with or hug. But my phone was blowing up and my SONA text thread was on fire. I didn’t feel so alone at all. On the way home I stopped by Pam’s and jumped up and down with her in the driveway. With so much gridlock in government right now it appears SONA actually helped make something happen. We succeeded in being part of that movement. It was a good day. I shared with my daughter. Next week—reconciliation in the House. Then the President signs. Then its law! This is by far the most historic piece of music legislation of our generation. We are beside ourselves. And if you’re a musician you should be too. P.S. SONA…The little grassroots-organization-that-could is now, in my opinion, as close to a union as you’re ever going to get. Please consider joining. For a mere $25 a year, look what you got? Thank you for reading! Please go over to my Facebook Page and give it a like! Here’s me on Twitter. And Insta. And a link to Confessions of a Serial Songwriter. Why haven’t you read it yet?